This natural color composite was taken during the Cassini spacecraft's April 16, 2005, flyby of Titan. It is a combination of images taken through three filters that are sensitive to red, green and violet light. Back in August of 1996, headlines around the world were ablaze with three remarkable words: "Life on Mars!" The evidence was circumstantial but compelling: a Martian meteorite recovered in the Antarctic contained what seemed to be fossilized bacteria. NASA's breathless press conference breaking the news, which pre-empted daytime programming, signaled that the discovery should be taken very seriously. But before long, scientists came to the general conclusion that it was probably all just a mistake. Never mind. That embarrassing episode might help explain why NASA scientists were so quick to muzzle talk of another such "discovery" last week. This one concerned the possibility of life on Saturn's largest moon, Titan. Space agency scientists waved off reports  which had been popping up in science publications and bouncing around the Internet  that something might be stirring out there. Such official caution notwithstanding, the findings that led to all the buzz cannot be dismissed entirely. The whispers began a few weeks ago, with reports coming from the team monitoring the Cassini spacecraft, which has been orbiting Saturn and barnstorming its moons since 2004. Titan was a major focus of the mission all along, since it's bigger than the planet Mercury and the only moon massive enough to have a significant atmosphere. That atmosphere is rich in organic compounds, including methane and other hydrocarbons, so while the moon's frigid temperatures preclude any sort of life as we know it, it has long been thought to offer hints about what a planet might look like before biology takes hold. Investigators have, however, pondered one other remote possibility. If an alternate form of life could exist with liquid methane taking the place of water in cells and other biological parts  something that's theoretically conceivable  Titan is just the sort of place it might thrive. About five years ago, NASA astrobiologist Chris McKay and others suggested that if such "methanogens" existed, their collective metabolism could lead to lower levels of ethane and acetylene in Titan's atmosphere than you'd normally expect, and a net migration of hydrogen down onto the surface, where the methanogens would theoretically be sucking it in as food. It's the same kind of clue that might pique the interest of aliens if they noticed the fluctuations of carbon dioxide in our own atmosphere as the changing seasons lead to more and less leaf coverage and greater or lesser CO2 uptake. 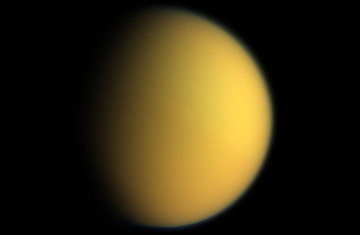 Scientists already knew there wasn't as much ethane in Titan's atmosphere as they'd expected. If there had been, the moon would have been covered with an ocean of the stuff several meters deep and Cassini saw nothing of the kind. Now, the spacecraft seems to have found that the other two conditions have been met as well. So does that mean methanogenic life exists? No. In the very hedged language of the scientist, it means that conditions have been found that are consistent with the presence of that life. But "consistent with" and "evidence for" are two very different things. As McKay says in an essay posted to the Cassini website this week: "This is still a long way from 'evidence of life'." [But], he continues, "it is extremely interesting." McKay goes on to list four possible explanations for the observations, "in order of their likely reality." First, the hydrogen migration might not really be happening. It's not a direct observation, but rather an extrapolation based on how much hydrogen is in Titan's upper atmosphere compared to the lower atmosphere. If the model that was used to make the extrapolation is wrong in some way, then the result could be a false positive. Second, if the model is correct, some other process could be pulling (or pushing) hydrogen toward the surface. Third some kind of strange surface chemistry, rather than living organisms, could be eating up the hydrogen. That's the same conclusion scientists reached  although not unanimously  when the Viking landers detected unexpected chemical activity on the surface of Mars in the 1970s. Fourth, and least likely: Life on Titan! The good news for those who are looking for extraterrestrial life is that even though actual biological activity comes last on McKay's list, it does remain an intriguing conjecture. These new results have done nothing, at least, to rule it out. Still, don't wait around for the press conference  at least not yet.